Developed and advanced radio technology. Chelsea, Manhattan, New York, New York, U.S.
Edwin Howard Armstrong (December 18, 1890 – January 31, 1954) was an American electrical engineer and inventor, best known for developing FM (frequency modulation) radio. He held 42 patents and received numerous awards, including the first Medal of Honor awarded by the Institute of Radio Engineers (now IEEE), the French Legion of Honor, the 1941 Franklin Medal and the 1942 Edison Medal. He was inducted into the National Inventors Hall of Fame and included in the International Telecommunication Union's roster of great inventors. Armstrong's boyhood home, 1032 Warburton Avenue, overlooking the Hudson River in Yonkers, New York, c. 1975. It was demolished in November 1982 due to fire damage. Armstrong was born in the Chelsea district of New York City, the oldest of John and Emily (Smith) Armstrong's three children. His father began working at a young age at the American branch of the Oxford University Press, which published bibles and standard classical works, eventually advancing to the position of vice president. His parents first met at the North Presbyterian Church, located at 31st Street and Ninth Avenue. His mother's family had strong ties to Chelsea, and an active role in church functions. When the church moved north, the Smiths and Armstrongs followed, and in 1895 the Armstrong family moved from their brownstone row house at 347 West 29th Street to a similar house at 26 West 97th Street in the Upper West Side. The family was comfortably middle class. At the age of eight, Armstrong contracted Sydenham's chorea (then known as St. Vitus' Dance), an infrequent but serious neurological disorder precipitated by rheumatic fever. For the rest of his life, Armstrong was afflicted with a physical tic exacerbated by excitement or stress. Due to this illness, he withdrew from public school and was home-tutored for two years. 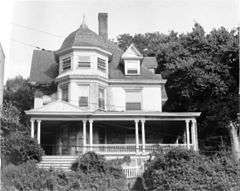 To improve his health, the Armstrong family moved to a house overlooking the Hudson River, at 1032 Warburton Avenue in Yonkers. The Smith family subsequently moved next door. Armstrong's tic and the time missed from school led him to become socially withdrawn. From an early age, Armstrong showed an interest in electrical and mechanical devices, particularly trains. He loved heights and constructed a makeshift backyard antenna tower that included a bosun's chair for hoisting himself up and down its length, to the concern of neighbors. Much of his early research was conducted in the attic of his parent's house. In 1909 Armstrong enrolled at Columbia University in New York City, where he became a member of the Epsilon Chapter of the Theta Xi engineering fraternity, and studied under Professor Michael Pupin at the Hartley Laboratories, a separate research unit at Columbia. Another of his instructors, Professor John H. Morecroft, later remembered Armstrong as being intensely focused on the topics that interested him, but somewhat indifferent to the rest of his studies. He was known for challenging conventional wisdom and being quick to question the opinions of both professors and peers. In one case he recounted how he tricked an instructor he disliked into receiving a severe electrical shock. He also stressed the practical over the theoretical, stating that progress was more likely the product of experimentation and work based on physical reasoning than on mathematical calculation and formulae (known as part of "mathematical physics"). Armstrong graduated from Columbia in 1913, earning an electrical engineering degree. He later received two honorary doctorates, from Columbia in 1929, and Muhlenberg College in 1941. 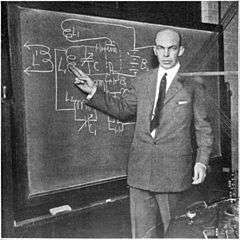 In 1934, he filled the vacancy left by John H. Morecroft's death, receiving an appointment as a Professor of Electrical Engineering at Columbia, a position he held the remainder of his life. Following college graduation, he received a $600 one-year appointment as a laboratory assistant at Columbia, after which he nominally worked as a research assistant, for a salary of $1 a year, under Professor Pupin. Unlike most engineers, Armstrong never became a corporate employee. He set up a self-financed independent research and development laboratory at Columbia, and owned his patents outright. 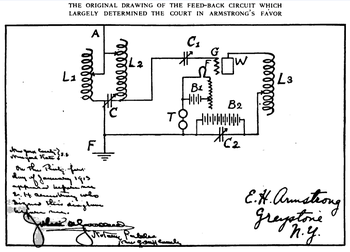 Armstrong's "feed back" circuit drawing, from Radio Broadcast vol. 1 no. 1 1922. Armstrong began working on his first major invention while still an undergraduate at Columbia. In late 1906, Lee de Forest had invented the three-element (triode) "grid Audion" vacuum-tube. How vacuum tubes worked was not understood at the time. De Forest's initial Audions did not have a high vacuum and developed a blue glow at modest plate voltages; De Forest improved the vacuum for Federal Telegraph. By 1912, how vacuum tubes worked was understood, and the advantages of high vacuum tubes was appreciated. While growing up, Armstrong had experimented with the early, temperamental, "gassy" Audions. Spurred by the later discoveries, he developed a keen interest in gaining a detailed scientific understanding of how vacuum-tubes worked. In conjunction with Professor Morecroft, he used an oscillograph to conduct comprehensive studies. His breakthrough discovery was determining that employing positive feedback (also known as "regeneration") produced amplification hundreds of times greater than previously attained, with the amplified signals now strong enough so that receivers could use loudspeakers instead of headphones. Further investigation revealed that, when the feedback was increased beyond a certain level, a vacuum-tube would go into oscillation, thus could also be used as a continuous-wave radio transmitter. Beginning in 1913 Armstrong prepared a series of comprehensive demonstrations and papers that carefully documented his research, and in late 1913 applied for patent protection covering the regenerative circuit. On October 6, 1914, U.S. patent 1,113,149 was issued for his discovery. Although Lee de Forest initially discounted Armstrong's findings, beginning in 1915 de Forest filed a series of competing patent applications that largely copied Armstrong's claims, now stating that he had discovered regeneration first, based on August 6, 1912 notebook entry, while working for the Federal Telegraph company, prior to the January 31, 1913 date recognized for Armstrong. The result was an interference hearing at the patent office to determine priority. De Forest was not the only other inventor involved — the four competing claimants included Armstrong, de Forest, General Electric's Langmuir, and Alexander Meissner, who was a German national, which led to his application being seized by the Office of Alien Property Custodian during World War One. Following the end of World War One, Armstrong enlisted representation by the law firm of Pennie, Davis, Martin and Edmonds. In order to finance his legal expenses, he began issuing non-transferable licenses for use of the regenerative patents to a select group of small radio equipment firms, and by November 1920 seventeen companies had been licensed. These licensees paid 5% royalties on their sales, which were restricted to only "amateurs and experimenters". Meanwhile, Armstrong reviewed his options for selling the commercial rights to his work. Although the obvious candidate was the Radio Corporation of America (RCA), on October 5, 1920 the Westinghouse Electric & Manufacturing Company took out an option for $335,000 for the commercial rights for both the regenerative and superheterodyne patents, with an additional $200,000 to be paid if Armstrong prevailed in the regenerative patent dispute. Westinghouse exercised this option on November 4, 1920. Legal proceedings related to the regeneration patent became separated into two groups of court cases. An initial court action was triggered in 1919, when Armstrong sued de Forest's company in district court, alleging infringement of patent 1,113,149. This court ruled in Armstrong's favor on May 17, 1921. But a second line of court cases, the result of the patent office interference hearing, would have a different outcome. The interference board had also sided with Armstrong, but he was unwilling to settle with de Forest for less than what he considered full compensation. Thus pressured, de Forest decided to continue his legal defense, and appealed the interference board decision to the District of Columbia district court. On May 8, 1924, that court ruled that it was de Forest who should be considered regeneration's inventor. Armstrong (along with much of the engineering community) was shocked by this course of events, and his side appealed this unexpected decision. But although the legal proceeding twice went before the U.S. Supreme Court, in 1928 and 1934, he was unsuccessful in overturning the decision. In response to the second Supreme Court decision upholding de Forest as the inventor of regeneration, Armstrong attempted to return his 1917 IRE Medal of Honor, which had been awarded "in recognition of his work and publications dealing with the action of the oscillating and non-oscillating audion". However, the organization's board refused to let him, and issued a statement that it "strongly affirms the original award". During this period, Armstrong's most significant accomplishment was the development of a "supersonic heterodyne" — soon shortened to "superheterodyne" — radio receiver circuit. This circuit made radio receivers more sensitive and selective and is still extensively used today. The key feature of the superheterodyne approach is the mixing of the incoming radio signal with a locally generated, different frequency signal within a radio set. This circuit is typically referred to as the mixer. The end result is a fixed, unchanging intermediate frequency, or I.F. signal. Since this intermediate frequency is unchanging, it is more easily amplified and detected by subsequent circuit stages that follow the mixer. In 1919, Armstrong filed an application for a U.S. patent of the superheterodyne circuit, which was issued the next year. This patent was subsequently sold to Westinghouse. The patent would be challenged, however, triggering yet another patent office interference hearing. Unfortunately, Armstrong ultimately lost this patent battle; although the outcome was less controversial than that involving the regeneration proceedings. The challenger was Lucien Lévy of France, who had also worked developing Allied radio communication during World War One. He had been awarded French patents in 1917 and 1918 that covered some of the same basic ideas used in Armstrong's superheterodyne receiver. AT&T, which was interested in radio development at this time, primarily for point-to-point extensions of its wired telephone exchanges, purchased the U.S. rights to Lévy's patent and contested Armstrong's grant. The subsequent court reviews continued until 1928, when the District of Columbia Court of Appeals disallowed all nine claims of Armstrong's patent, assigning priority for seven of the claims to Lévy, and one each to Ernst Alexanderson of General Electric and Burton W. Kendall of Bell Laboratories. Although most early radio receivers used regeneration, Armstrong approached RCA's David Sarnoff, who he had known since giving a demonstration of his regeneration receiver in 1913, about the corporation offering superheterodynes as a superior offering to the general public. (The ongoing patent dispute was not a hindrance, because extensive cross-licensing agreements signed in 1920 and 1921 between RCA, Westinghouse and AT&T meant that Armstrong could freely use the Lévy patent.) Superheterodyne sets were initially thought to be prohibitively complicated and expensive, as the initial designs required multiple tuning knobs and used nine vacuum-tubes. However, in conjunction with RCA engineers, Armstrong developed a simpler, less costly design. RCA introduced its superheterodyne Radiola sets in the U.S. market in early 1924, and they were an immediate success, dramatically increasing the corporation's profits. These sets were considered so valuable that RCA would not license the superheterodyne to other U.S. manufacturing companies until 1930. The regeneration legal battle had one serendipitous outcome for Armstrong. While he was preparing apparatus to counteract a claim made by a patent attorney, he "accidentally ran into the phenomenon of super-regeneration", where, by rapidly "quenching" the vacuum-tube oscillations, he was able to achieve even greater levels of amplification. A year later, in 1922, Armstrong sold his super-regeneration patent to RCA for $200,000 plus 60,000 shares of corporation stock, which was later increased to 80,000 shares in payment for consulting services. This made Armstrong RCA's largest shareholder, and he noted that "The sale of that invention was to net me more than the sale of the regenerative circuit and the superheterodyne combined". RCA envisioned selling a line of super-regenerative receivers until superheterodyne sets could be perfected for general sales, however, it turned out the circuit was not selective enough to make it practical for broadcast receivers. "Static" interference — extraneous noises caused by sources such as thunderstorms and electrical equipment — bedeviled early radio communication using amplitude modulation (AM) and perplexed numerous inventors attempting to eliminate it. Many ideas for static elimination were investigated, with little success. In the mid-1920s, Armstrong began researching whether he could come up with a solution. He Initially, and unsuccessfully, attempted to resolve the problem by modifying the characteristics of existing AM transmissions. One approach considered as a potential solution had been the use of frequency modulation (FM) transmissions, where, in order to encode audio, instead of varying (technically known as "modulating") the amplitude (strength) of a radio signal, as was done for AM transmissions, the frequency was varied. However, in 1922 John Renshaw Carson of AT&T, inventor of Single-sideband modulation (SSB), had published a Proceedings of the IRE paper which included a detailed mathematical analysis which showed that FM transmissions did not provide any improvement over AM. Although the Carson bandwidth rule for FM is still important today, this review turned out to be incomplete, because it only analyzed what is now known as "narrow-band" FM. In early 1928 Armstrong began researching the capabilities of frequency modulation. Although there were few others involved in FM research at this time, he did have knowledge of a project being conducted by RCA engineers, who were investigating whether FM shortwave transmissions were less susceptible to fading than AM. In 1931 these engineers conducted a successful FM shortwave link transmitting the Schmeling-Stribling fight broadcast from California to Hawaii, and noted at the time that the signals seemed to be less affected by static, but the project made little further progress. Working in secret in the basement laboratory of Columbia's Philosophy Hall, Armstrong slowly developed what eventually resulted in wide-band FM, in the process discovering significant advantages over the earlier "narrow-band" FM transmissions. He was granted five U.S. patents covering the basic features of new system on December 26, 1933. Initially, the primary claim was that his FM system was effective at filtering out the noises produced in receivers by vacuum-tubes. Armstrong had a standing agreement to give RCA the right of first refusal to his patents. In 1934 he made a presentation of his new system to RCA president Sarnoff. Sarnoff was somewhat taken aback by its complexity, as he had hoped it would be possible to eliminate static merely by adding a simple device to existing receivers. From May 1934 until October 1935 Armstrong conducted field tests of his FM technology from an RCA laboratory located on the 85th floor of the Empire State Building in New York City. An antenna attached to the building's spire transmitted signals for distances up to 80 miles (130 km). These tests helped demonstrate FM's static-reduction and high-fidelity capabilities. However RCA, which was heavily invested in perfecting television broadcasting, chose not to invest in FM, and instructed Armstrong to remove his equipment. Denied the marketing and financial clout that RCA would have brought, Armstrong decided to finance his own development and form ties with smaller members of the radio industry, including Zenith and General Electric, to promote his invention. Armstrong thought that FM had the potential to replace AM stations within 5 years, which he promoted as a boost for the radio manufacturing industry, then suffering from the effects of the Great Depression, since making existing AM radio transmitters and receivers obsolete would necessitate that stations buy replacement transmitters and listeners purchase FM-capable receivers. In 1936 he published a landmark paper in the Proceedings of the IRE that documented the superior capabilities of using wide-band FM. (This paper would be reprinted in the August 1984 issue of Proceedings of the IEEE.) A year later, a paper by Murray G. Crosby (inventor of Crosby system for FM Stereo) in the same journal provided further analysis of the wide-band FM characteristics, and introduced the concept of "threshold", demonstrating that there is a superior signal to noise ratio when the signal is stronger than a certain level. In June 1936, Armstrong gave a formal presentation of his new system at the U.S. Federal Communications Commission (FCC) headquarters in Washington, D.C. For comparison, he played a jazz record using a conventional AM radio, then switched to an FM transmission. A United Press correspondent was present, and recounted in a wire service report that: "if the audience of 500 engineers had shut their eyes they would have believed the jazz band was in the same room. There were no extraneous sounds." Moreover, "Several engineers said after the demonstration that they consider Dr. Armstrong's invention one of the most important radio developments since the first earphone crystal sets were introduced." Armstrong was quoted as saying he could "visualize a time not far distant when the use of ultra-high frequency wave bands will play the leading role in all broadcasting", although the article noted that "A switchover to the ultra-high frequency system would mean the junking of present broadcasting equipment and present receivers in homes, eventually causing the expenditure of billions of dollars." In the late 1930s, as technical advances made it possible to transmit on higher frequencies, the FCC investigated options for increasing the number of broadcasting stations, in addition to ideas for better audio quality, known as "high-fidelity". In 1937 it introduced what became known as the Apex band, consisting of 75 broadcasting frequencies from 41.02 to 43.98 MHz. As on the standard broadcast band these were AM stations, but with higher quality audio — in one example, a frequency response from 20 Hz to 17,000 Hz +/- 1 dB — because station separations were 40 kHz instead of the 10 kHz spacings used on the original AM band. Armstrong worked to convince the FCC that a band of FM broadcasting stations would be a superior approach. That year he financed the construction of the first FM radio station, W2XMN (later KE2XCC) at Alpine, New Jersey. FCC engineers had believed that transmissions using high frequencies would travel little farther than line-of-sight distances, limited by the horizon. However, when operating with 40 kilowatts on 42.8 MHz, the station could be clearly heard 100 miles (160 km) away, matching the daytime coverage of a full power 50-kilowatt AM station. FCC studies comparing the Apex station transmissions with Armstrong's FM system concluded that his approach was superior. In early 1940, the FCC held hearings on whether to establish a commercial FM service. Following this review, the FCC announced the establishment of an FM band effective January 1, 1941, consisting of forty 200 kHz-wide channels on a band from 42-50 MHz, with the first five channels reserved for educational stations. Existing Apex stations were notified that they would not be allowed to operate after January 1, 1941 unless they converted to FM. Although there was interest in the new FM band by station owners, construction restrictions that went into place during World War Two limited the growth of the new service. Following the end of World War Two, the FCC moved to standardize its frequency allocations. One area of concern was the effects of tropospheric and Sporadic E propagation, which at times reflected station signals over great distances, causing mutual interference. A particularly controversial proposal, spearheaded by RCA, was that the FM band needed to be shifted to higher frequencies in order to avoid this potential problem. This reassignment was fiercely opposed as unneeded by Armstrong, but in the end he lost out, and the FM band was reallocated, becoming one hundred channels from 88–108 MHz. After a short period of allowing existing FM stations to broadcast on both their old and new frequencies, the original transmitters had to shut down, making the expensive receivers that had been purchased by the public for the original band obsolete. Armstrong felt the FM band reassignment had been primarily inspired by a desire to cause a disruption that would limit FM's ability to challenge the existing radio industry, including RCA's AM radio properties that included the NBC radio network, plus the other major networks including CBS, ABC and Mutual. The change was also thought to have been favored by AT&T, as the elimination of FM relaying stations would require radio stations to lease wired links from that company. Particularly galling was the fact that the FCC then assigned TV channel 1 to the 44-50 MHz segment of the old FM band, despite the fact that in 1941 the FCC had adopted FM sound as part of the NTSC television standard, moreover, the video portions of the standard were even more susceptible to interference than the audio. Channel 1 eventually had to be deleted as well, with all TV broadcasts licensed at frequencies 54 MHz or higher, and in the United States these frequencies are no longer widely used for emergency first responders, those services having moved mostly to UHF. Although the FM band shift was a significant economic setback, there was still reason for optimism, and a book published in 1946 by Charles A. Siepmann heralded FM stations as "Radio's Second Chance". In late 1945, Armstrong contracted with John Orr Young, founding member of the public relations firm Young & Rubicam, to conduct a national campaign promoting FM broadcasting, especially by educational institutions. Article placements promoting both Armstrong personally and FM were made with general circulation publications including The Nation, Fortune, the New York Times, Atlantic Monthly, and The Saturday Evening Post. In 1940, RCA offered Armstrong $1,000,000 for a non-exclusive, royalty-free license to use his FM patents, but he refused this offer, primarily because he felt this would be unfair to the other licensed companies, which had to pay 2% royalties on their sales. Over time this impasse with RCA would come to dominate Armstrong's life. RCA countered by conducting its own FM research, eventually developing what it claimed was a non-infringing FM system. The corporation also encouraged other companies to stop paying royalties to Armstrong. Outraged by this turn of events, in 1948 Armstrong filed suit against RCA and the National Broadcasting Company, accusing them of patent infringement and that they had "deliberately set out to oppose and impair the value" of his invention, for which he requested treble damages. Although confident that this suit would be successful and result in a major monetary award, the protracted legal maneuvering that followed eventually began to severely affect his finances, especially after his primary patents expired in late 1950. Bitter and overtaxed by years of litigation and mounting financial problems, Armstrong lashed out at his wife one day with a fireplace poker, striking her on the arm. She left their apartment to stay with her sister, Marjorie Tuttle, in Granby, Connecticut. Sometime during the night of January 31/February 1, 1954, with his wife in Connecticut and three servants having left for the day, Armstrong removed the air conditioner from a window in his twelve-room apartment on the thirteen-floor of River House in New York City, and jumped to his death. His body—fully clothed, with a hat, overcoat and gloves—was found in the morning on a third-floor balcony by a River House employee. The New York Times described the contents of his two-page suicide note to his wife: "he was heartbroken at being unable to see her once again, and expressing deep regret at having hurt her, the dearest thing in his life." The note concluded, "God keep you and Lord have mercy on my Soul." David Sarnoff declaimed any responsibility, telling Carl Dreher directly that "I did not kill Armstrong." After his death, a friend of Armstrong estimated that 90 percent of his time was spent on litigation against RCA. U.S. Senator Joseph McCarthy (R-Wisconsin) reported that Armstrong had recently met with one of his investigators, and "was mortally afraid that secret radar discoveries he and other scientists had made were being fed to the communists as fast as they could be developed". Armstrong was buried in Locust Grove Cemetery, Merrimac, Massachusetts. Following her husband's death, Marion Armstrong took charge of pursuing his estate's legal cases. In late December 1954, it was announced that through arbitration an out-of-court settlement of "approximately $1,000,000" had been made with RCA. Dana Raymond of Cravath, Swaine & Moore in New York served as counsel in that litigation. Marion Armstrong was able to formally establish Armstrong as the inventor of FM following protracted court proceedings over five of his basic FM patents, with a series of successful suits, which lasted until 1967, against other companies that were found guilty of infringement. Armstrong has been called "the most prolific and influential inventor in radio history". The superheterodyne process is still extensively used by radio equipment. Eighty years after its invention, FM technology has started to be supplemented, and in some cases replaced, by more efficient digital technologies. The introduction of digital television eliminated the FM audio channel that had been used by analog television, HD radio has added digital sub-channels to FM band stations, and, in Europe and Pacific Asia, Digital Audio Broadcasting bands have been created that will, in some cases, eliminate existing FM stations altogether. However, FM broadcasting is still used internationally, and remains the dominant system employed for audio broadcasting services. Armstrong and his new wife Esther Marion MacInnis in Palm Beach in 1923. The radio is a portable superheterodyne that Armstrong built as a present for her. In 1923, combining his love for high places with courtship rituals, Armstrong climbed the WJZ (now WABC) antenna located atop a twenty-story building in New York City, where he reportedly did a handstand, and when a witness asked him what motivated him to "do these damnfool things", Armstrong replied "I do it because the spirit moves me". Armstrong had arranged to have photographs taken, which he had delivered to David Sarnoff's secretary, Marion MacInnis. Armstrong and MacInnis married later that year. Armstrong bought a Hispano-Suiza motor car before the wedding, which he kept until his death, and which he drove to Palm Beach, Florida for their honeymoon. A publicity photograph was made of him presenting Marion with the world's first portable superheterodyne radio as a wedding gift. He was an avid tennis player until an injury in 1940, and drank an Old Fashioned with dinner. Politically, he was described by one of his associates as "a revolutionist only in technology — in politics he was one of the most conservative of men". In 1955 Marion Armstrong founded the Armstrong Memorial Research Foundation, and participated in its work until her death in 1979 at the age of 81. She was survived by two nephews and a niece. The Philosophy Hall at Columbia University, which housed the basement laboratory where Armstrong developed FM radio. In 1917 Armstrong was the first recipient of the IRE's (now IEEE) Medal of Honor. For his wartime work on radio the French government gave him the Legion of Honor in 1919. He was awarded the 1941 Franklin Medal, and in 1942 received the AIEEs Edison Medal "for distinguished contributions to the art of electric communication, notably the regenerative circuit, the superheterodyne, and frequency modulation". The ITU added him to its roster of great inventors of electricity in 1955. In 1980 he was inducted into the National Inventors Hall of Fame, and appeared on a U.S. postage stamp in 1983. The Consumer Electronics Hall of Fame inducted him in 2000, "in recognition of his contributions and pioneering spirit that have laid the foundation for consumer electronics." Columbia University established the Edwin Howard Armstrong Professorship in Computer Science in his memory. Philosophy Hall, the Columbia building where Armstrong developed FM, was declared a National Historic Landmark. Armstrong's boyhood home in Yonkers, New York was recognized by the National Historic Landmark program and the National Register of Historic Places, although this was withdrawn when the house was demolished. Armstrong Hall at Columbia was named in his honor. The hall, located at the northeast corner of Broadway and 112th Street, was originally an apartment house but was converted to research space after being purchased the university. It is currently home to the Goddard Institute for Space Studies, a research institute dedicated to atmospheric and climate science that is jointly operated by Columbia and the National Aeronautics and Space Administration. A storefront in a corner of the building houses Tom's Restaurant, a longtime neighborhood fixture that inspired Susanne Vega's song "Tom's Diner" and was used for establishing shots for the fictional "Monk's diner" in the "Seinfeld" television series. A second Armstrong Hall, also named for the inventor, is located at the United States Army Communications and Electronics Life Cycle Management Command (CECOM-LCMC) Headquarters at Aberdeen Proving Ground, Maryland. U.S. Patent 1,113,149 : "Wireless Receiving System"
U.S. Patent 1,336,378: "Antenna with Distributed Positive Resistance"
U.S. Patent 1,342,885 : "Method of Receiving High Frequency Oscillation"
U.S. Patent 1,424,065: "Signaling System"
U.S. Patent 1,611,848 : "Wireless Receiving System for Continuous Wave"
1 2 Tsividis, Yannis (Spring 2002). "Edwin Armstrong: Pioneer of the Airwaves". Columbia Magazine. Living Legacies: Great Moments and Leading Figures in the History of Columbia University. New York: Columbia University. Retrieved December 12, 2010. 1 2 3 4 5 "Armstrong, FM Inventor, Dies In Leap From East Side Suite". The New York Times. February 2, 1954. p. 1. ISSN 0362-4331. Maj. Edwin H. Armstrong, whose inventions provided much of the basis for modern broadcasting, was found dead yesterday morning on a third-floor balcony of River House, 435 East Fifty-second Street. The 63-year-old electrical engineer had plunged from a window of his luxurious thirteenth-floor apartment, apparently late Sunday evening or during the night. ↑ "What Everyone Should Know About Radio History: Part II" by Prof. J. H. Morecroft, Radio Broadcast, August, 1922, pages 294-302. ↑ Empire of the Air by Tom Lewis, 1991, pages 60-61. ↑ Radio's 100 Men of Science (Edwin Howard Armstrong entry) by Orrin E. Dunlap, 1944, page 250. ↑ "Major Armstrong Goes to Columbia". The New York Times. August 7, 1934. p. 20. ISSN 0362-4331. The appointment of Major Edwin Howard Armstrong as Professor of Electrical Engineering at Columbia University yesterday by Dr. Nicholas Murray Butler, president of the university. ↑ The Legacies of Edwin Howard Armstrong, "E. H. Armstrong" by Thomas Sykes, 1990, page 22. ↑ DeForest Radio Co. v. General Electric Co., 283 U.S. 664 (May 25, 1931). Fleming and Lilenfeld had advocated high vacuum. "Of critical importance in the present controversy is the effect of the presence of gas within the tube." "In consequence, the low vacuum tube is more sensitive both as a detector and as an amplifier than a tube of high vacuum." "August 20, 1912, the earliest date claimed for Langmuir, was rejected rightly, we think, by the District Court, which held that Langmuir was anticipated by Arnold in November, 1912. But before the earlier date, De Forest sought and obtained a high vacuum in the audions used as amplifiers, and observed that when the vacuum was too low the blue glow effect occurred at from 15 to 20 volts. In order to secure higher voltages from the audions used as amplifiers and to procure the requisite high vacuum, he had some of the bulbs re-exhausted while superheated. By August 1912, the Telegraph Company used De Forest amplifying audions at 54 volts, and by November, they were used by another at 67 1/2 volts. This was possible only because the tubes had thus been exhausted of gas, which would otherwise have ionized with blue glow at from 20 to 30 volts." ↑ "Operating Features of the Audion" by E. H. Armstrong, Electrical World, December 12, 1914, pages 1149-1152. ↑ Armstrong, E. H. (August 2, 1917). "Operating Features of the Audion". Annals of the New York Academy of Sciences. 27 (1): 215–243. doi:10.1111/j.1749-6632.1916.tb55188.x. ↑ Lewis (1991), pages 77, 87. ↑ Invention and Innovation in the Radio Industry by W. Rupert Maclaurin, 1949, page 122. ↑ Radio Manufacturers of the 1920's: Volume 3 by Alan Douglas, 1991, page 3. Organized broadcasting barely existed when the initial "amateur and experimental" licenses where granted. By 1922 a "broadcast boom" in the U.S. saw a tremendous growth in the sale of radio receivers to the general public. Westinghouse tried to claim that these sales infringed on its rights, as they should be considered "commercial", but the courts did not agree. Thus, the companies that held these "amateur and experimental" license rights found they now had a very valuable asset. ↑ Douglas (1991), pages 193-198, 203. ↑ The Contunuous Wave: Technology and American Radio, 1900-1932 by Hugh G. J. Aitken, 1985, page 467. ↑ "Who Invented the Superheterodyne?" by Alan Douglas, originally published in the The Legacies of Edwin Howard Armstrong from the "Proceedings of the Radio Club of America", Nov. 1990, Vol.64 no.3, pages 123-142. ↑ Maclaurin (1949). October 12, 1947 letter from Armstrong to the author, page 122. ↑ Early FM Radio by Gary L. Frost, 2010, pages 72-73. ↑ Raymond, Dana M. "Air War: Legal Battles Over FM Radio". Fathom. Columbia University. ↑ Frost (2010), page 95. ↑ Katzdorn, Mike. "Beginning of Armstrong's FM station W2XMN at Alpine, NJ (1937)". Retrieved December 19, 2011. ↑ "New Radio Shown" (UP), Bellingham (Washington) Herald, June 17, 1936, page 2. ↑ America's Apex Broadcasting Stations of the 1930's by John Schneider. ↑ "Armstrong, Edwin Howard". Current Biography. The H. W. Wilson Company: 23–26. 1940. ↑ Radio's Second Chance by Charles A. Siepmann, 1946, pages 239-253. ↑ "A Case study of Edwin Howard Armstrong's public relations campaign for fm" (thesis) by Jessica Francis, December 14, 2012, pages 16, 19. ↑ Lewis (1991), pages 247-278, 300-328. ↑ Stashower, Daniel (2002), The Boy Genius and the Mogul: the untold story of television, New York: Broadway Books, ISBN 0767907590, His health began to suffer and his behavior grew erratic. On one occasion he came to believe that someone had poisoned his food and insisted on having his stomach pumped. On another, his wife fled the house as Armstrong lashed out with a fireplace poker. ↑ Kaempffert, Waldemar (December 9, 1956). "Stubborn genus". The New York Times. p. 297. Retrieved February 4, 2012. After he penned the last sentence, "God keep you and the Lord have mercy on my soul," he put on his overcoat, hat and gloves and stepped out of a window thirteen stories above the ground. ↑ Dreher (1976), page 207. ↑ "Sen. McCarthy Says Armstrong Feared Reds Were Stealing His Radar Secrets" (AP), Illinois State Journal, February 3, 1954, page 9. ↑ Griffith, John (January 1, 2001). "Edwin Howard Armstrong". Find A Grave. Retrieved December 20, 2011. ↑ "Armstrong Suit Over FM Settled". The New York Times. December 31, 1954. p. 20. ISSN 0362-4331. The Radio Corporation of America and the National Broadcasting Company have settled for "approximately $1,000,000" claims against them by the estate of the late Maj. Edwin H. Armstrong. ↑ Lewis (1991), page 358. ↑ Campbell, Richard; Christopher R. Martin; Bettina Fabos (2011). Media and Culture: An Introduction to Mass Communication, 8th Ed. MacMillan. p. 124. ISBN 0312644655. ↑ "Norway to Become First Country to Switch Off FM Radio in 2017" by Scott Roxborough, Hollywood Reporter, April 20, 2015. ↑ Dreher (1976), page 46. ↑ Lewis (1991), page 160. Three of the photographs are included in the pictorial section between pages 118-119. ↑ Dreher (1976), page 208. ↑ "Esther Armstrong, 81, the Wife Of Inventor of FM Radio System". The New York Times. August 10, 1979. p. A13. ISSN 0362-4331. Esther Marion Armstrong, the wife of the late Maj. Edwin Howard Armstrong, a leading American inventor, died Wednesday at the Exeter (N.H.) Hospital, after a brief illness. She was 81 years old and lived in Rye Beach, N.H.
↑ "IEEE Medal of Honor". IEEE Global History Network. IEEE. June 27, 2011. Retrieved July 7, 2011. ↑ "Withdrawal of National Historic Landmark Designation: Edwin H. Armstrong House". National Historic Landmark summary listing. National Park Service. Retrieved January 25, 2008. Ira Brodsky. The History of Wireless: How Creative Minds Produced Technology for the Masses. St. Louis: Telescope Books, 2008. Ken Burns. Empire of the Air. Documentary that first aired on PBS in 1992. Süsskind, Charles (1970). "Armstrong, Edwin Howard". Dictionary of Scientific Biography. New York. pp. 287–288 Charles Scribner's Sons. ISBN 0-684-10114-9. Wikimedia Commons has media related to Edwin Howard Armstrong. Houck Collection - A collection of images and documents that belonged to Armstrong's assistant, Harry W. Houck, which have been annotated by Mike Katzdorn. Ammon, Richard T., "The Rolls Royce Of Reception : Super Heterodynes - 1918 to 1930".